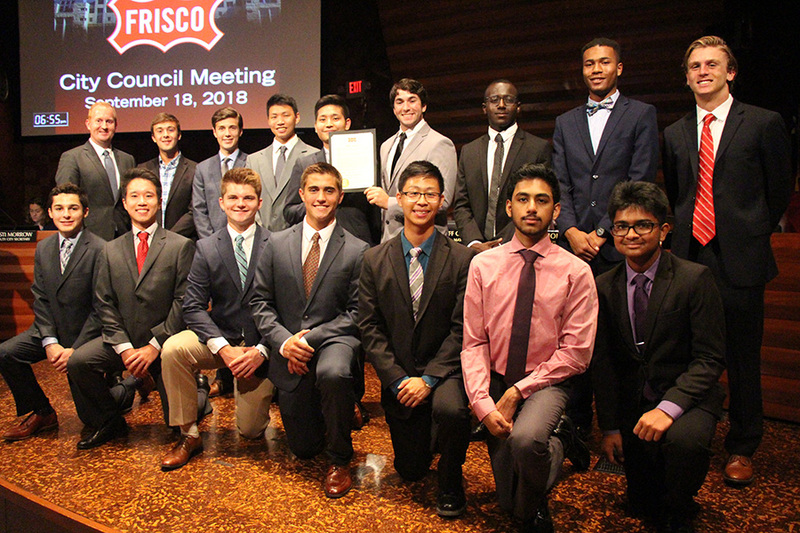 On 18 September 2018, Frisco’s Mayor Cheney presented a Proclamation to the 22 Boys State Delegates that attended Texas Boys State at the University of Texas in Austin. These young men, now seniors in high school, represented Post 178 and the City of Frisco. Mayor Cheney stated “I, Jeff Cheney, Mayor of the City of Frisco, do hereby proclaim September 18, 2018 as: FRISCO BOYS STATESMEN DAY”. Mayor Cheney praised the young men for their extraordinary efforts, accomplishments, leadership, and representing the City of Frisco. The Mayor had each of the Statesmen introduce themselves and tell which Frisco high school they were attending. After introducing themselves and answering a few questions; the Boy Statesmen sang the Texas Boys State song to all attendees. We can be very proud of these young men for their accomplishments. They are the future leaders of our City, County, and State. Now begins the time for the 2019 Boys State Program. We will be contacting each Frisco high school, Legacy Christian Academy, and our Home School contact for recommendations of juniors to be interviewed for Boys State. Post 178 Boys State committee includes Paul Jones, Ed Kelly, Marty Martel, Ted Ruybal, Larry Wilhelm, and Larry Marshall. Mike Strand has been the Boys State Chair since Post 178 was formed in 2014. Mike must be congratulated for the outstanding job he did. He has developed the Boys State program to one of the best; if not the best, in the State of Texas. Thank you, Mike, for the job well done and you will be missed. Good luck in Colorado. This entry was posted in Americanism, Boys and Girls State. Bookmark the permalink. Mike Strand will indeed be missed! From the ALA 178 Girls State Committee… enduring thanks to Mike for all his support as we launched the Unit’s GS program. Your guidance was immeasurable! If you would like to renew your membership, please follow this link to renew on the American Legion website.